The other night I came home to a cloud of smoke in the kitchen. The smoke alarm wasn’t going off, but something had clearly burned. I would have panicked, but I opened the door to find Andy standing next to the stove, spatula in hand, and a very sad look on his face. I couldn’t be mad at him, after all, there was a not quite charred plate of food waiting for me. The real surprise was that the food was amazing. (Not burned at all, I think he just burned the seasoning in the pan.) It was probably one of the best meals I’ve had in a long time, and it wasn’t even difficult to make. Oh yeah, and it was Paleo all because Andy has used almond flour instead of regular flour. So good and honestly, I think I’m using almond flour to bread my chicken from now on. It turned out way better than when I use flour. Not sure why, but it stuck to the meat so much better. Recommending this to everyone. It’s so good, so easy, and like I said, Paleo and Whole 30 approved. Cover chicken in plastic wrap, and using a mallet, pound the chicken to about 3/4 of an inch thick. Dredge chicken in almond flour and salt to coat. In a medium heat skillet, add olive oil and saute for 5-7 minutes on each side, turning when golden brown. Dash with lemon pepper seasoning in pan. Remove from pan and set aside. Add lemon slices to pan and then add asparagus. Make sure lemon slices are on the bottom of the pan so they caramelize. When asparagus is done and lemons are golden brown, add chicken back into pan and allow chicken to be coated in lemon sauce. 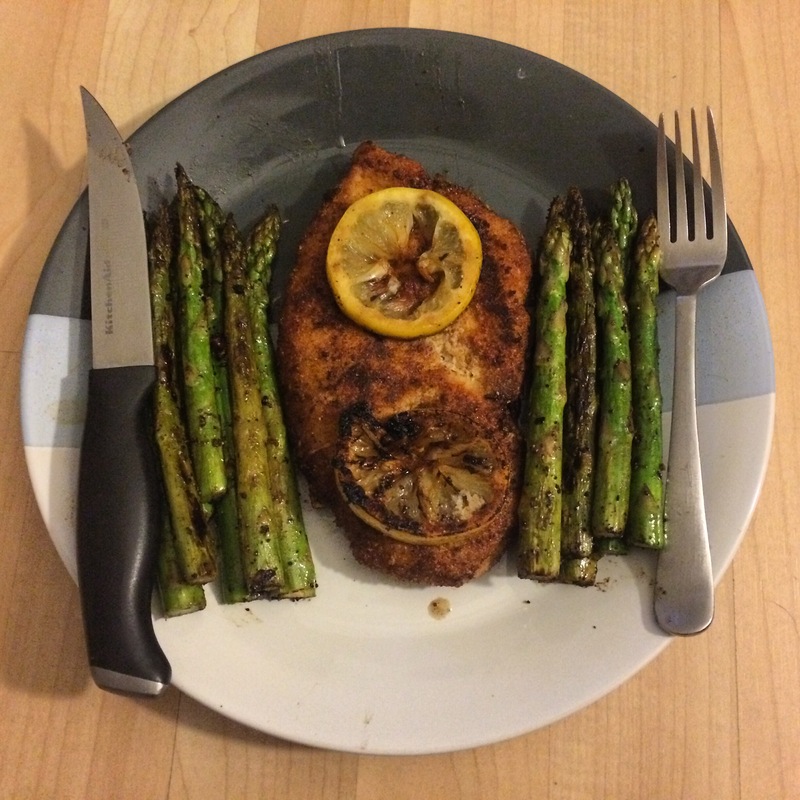 Plate with asparagus and lemons on top of chicken. Enjoy.